24: Live Another Day could be the first of many new adventures for Jack Bauer. Kiefer Sutherland’s rogue operative could feature in another limited series or a spinoff film if “there’s more story to be told”, exec producer Howard Gordon told IGN. “I think [the series could continue] if it’s successful, if the audience is into it and we feel like there’s more story to be told,” Gordon said. The 12-part limited series Live Another Day is currently shooting in London, with Mary Lynn Rajskub reprising her role of Chloe O’Brian opposite Sutherland. Gordon hinted that O’Brian now resembles “a cross between Lisbeth Salander and Edward Snowden” and also revealed new details about the character played by Yvonne Strahovski. “She’s a CIA agent whose husband – a fellow CIA agent – is a traitor and was caught selling secrets,” he explained. 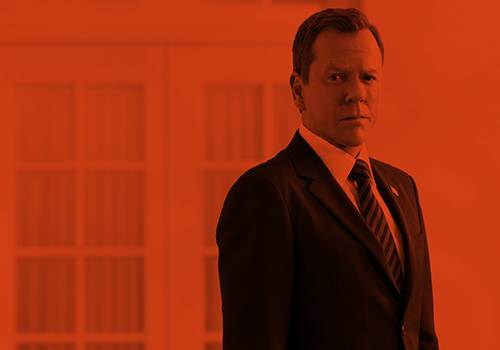 24: Live Another Day will air on Fox in the US and on Sky1 in the UK from May. This entry was posted by Courtney on Thursday, February 20th, 2014 at 12:01 pm. It is filed under 24, 24: Live Another Day, News. You can follow any responses to this entry through the Comments Feed.